According to biblical chronology, God created Adam and Eve around 6,000 years ago. However, biblical and geological evidence make it clear that the earth itself — not man — has existed for a longer time. The key to comprehending this little-known fact lies in the correct understanding of Genesis 1:1-2. Something tremendous is indicated to have occurred between what is stated to have been the original creation of the earth (verse 1) and the statement in verse 2: “And the earth was [or as it could be better translated, “had become”] without form [Hebrew: tohu] and void.” The Hebrew word tohu means “ruin, confusion, emptiness” (see any Hebrew-English lexicon). Yet Isaiah 45:18 shows that God did not create the earth in “vain” (same Hebrew word, tohu). So something occurred between Genesis 1:1 — the original creation of the earth — and Genesis 1:2 which introduces the creation week. What occurred between events and conditions described in these two verses is revealed in other biblical passages. What is described in the seven 24-hour days of Genesis 1:2-31 is actually a new creation and a restoring to order (see Psalm 104:30). God made the earth a fit habitation for humankind. A more complete study of this subject is available in our free article How Old is the Earth and How Long Were the Days of Creation? Theistic evolutionists and even theologians often say that the “days” described in the first chapter of Genesis are really “epochs” of time each perhaps representing a thousand or more years in length. A look at the creation account and a simple knowledge of nature clearly show how long they were. Notice that plants were created on the third day. But the sun did not shine in full strength on the earth’s surface until the fourth day. If these “days” were thousands of years long, then how could the plants have survived all that time without sunshine? Furthermore, the insects which pollinate many of these plants were not created until the sixth day! Each day of creation week is not some long epoch, but exactly what the scripture says, a day and night of 24 hours. Each day is an evening and a morning — that is, nighttime and daytime. A more complete study of this subject is available in our free article: How Old is the Earth and How Long Were the Days of Creation? Genesis 2, sometimes referred to as “the second account” of Creation, is a reiteration of Genesis 1 from a different viewpoint. 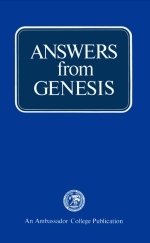 Genesis 2 emphasizes the reason and purpose behind the creation of Adam and Eve, and describes God’s method of creating as well as other conditions extant at the time. The purpose of verse 19 is not to explain when God created the animals, but how, and to point out Adam’s responsibility in naming each kind. God used the naming of these animals as an opportunity to show Adam that he — unlike the animals — lacked a female counterpart. Likewise, that is why verses 21-25 only concern themselves with telling us why and how the woman was created. It’s obvious that Genesis 1 and 2 both speak of the same events and they mutually amplify each other. Genesis 1:24-31 tells us that God made mankind and other life forms on the sixth day. Genesis 2:19 is completely agree­ able with this order of creative events on the sixth day. For more questions and answers, please check out the post: Questions and Answers from Genesis. This entry was posted on Monday, October 20th, 2014 at 12:01 am	and is filed under Doctrine, Old Testament History.